While the boy had his zombie lunch, the girl wanted something a little less zombie-ish. I had her help pick a perfect Lunchbox Love note for her lunch theme, which ended up as ghosts! Faith had a ham and cheese sandwich, cut with a ghost cutter, with mini cheddar letters spelling out BOO. To the right, she had cantaloupe with a ghost pick and carrots with no pick. Not pictures, she took yogurt, a granola bar and a Squeez'ems of applesauce (this might be our new favorite side dish). 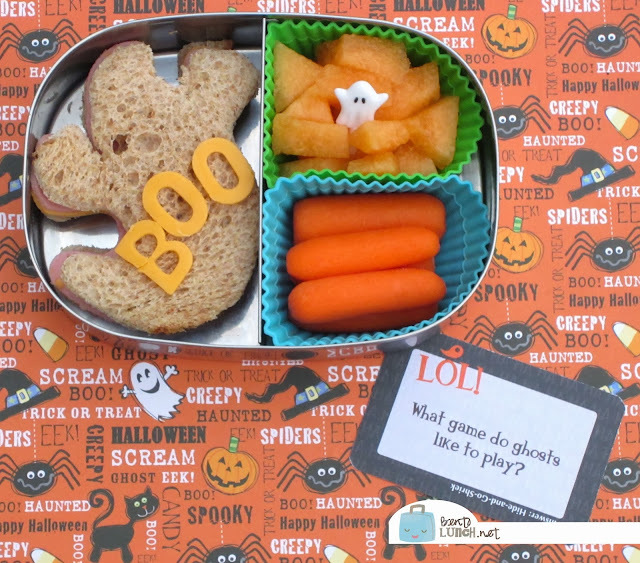 Lunch is packed in a Lunchbots Duo, and accompanied with a Lunchbox Love Halloween joke! Boo! such a fun bento! Very cute! What are the size of the cups (separators) you are using in this one. I've been searching for some larger ones that the traditional cupcake size I have. love your note cards. Where did you get them? Can you write your own messages? My son is a new reader so I think this will be very useful for him to practice independent reading. These are from Lunchbox Love. Each card has a simple message on one side and a fact or joke on the other. There are a few blanks in each box to add your own and there's room to fit a small note on most, even if they are printed. in bens bento, you had said the baby carrots were not for halloween. I personally think thta they did tie in,(they are orange, for halloween) so it was a great halloween bento. Good job on all the bentos!